Inklingo makes appliqué easier, more precise, and faster by eliminating all the tracing and special marking. 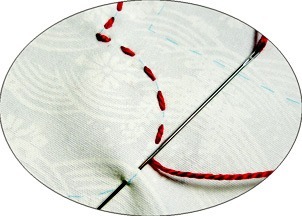 Spend your time stitching, not tracing or positioning fabric. Take advantage of the FREE Inklingo Appliqué download and the FREE Appliqué Printing Instructions to see how easy it is to prepare blocks for appliqué. Most quilters just need to see their first shapes on fabric to realize that Inklingo is the quilting tool we've always wanted. That's why I want to make it easy for you to print in the next few minutes. See why quilters love Inklingo for appliqué. Please click on the covers for detailed descriptions. We print on the wrong side of fabric with Inklingo for piecing, but for appliqué, we can print on the right side of the fabric OR on the wrong side for perfect positioning—in 20 different colors—or on freezer paper. Fabric prints just like paper when it is stabilized with freezer paper, and Inklingo shapes are printed with colors of ink that wash out easily. Inklingo allows you to print any size with an ordinary Inkjet printer which prints 8.5 inches wide. Just change the settings in the Print Dialog box. 3 x 3? Yes! 16 x 16? Yes. 5.75 x 5.75? Yes. Any size! For the largest sizes, the background is pieced. For the smallest sizes, the fabric is cut smaller than the freezer paper. In addition to the instructions for printing on fabric, there are special notes for printing appliqué designs in any size. Appliqué Printing The free PDF includes complete instructions for printing Inklingo appliqué designs in any size by using the options in the Print Dialog Box. Printing with Inklingo The free chapter of The Inklingo Handbook includes complete instructions for printing on fabric. 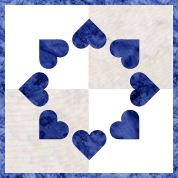 It is included in the free shape collection for LeMoyne Star. Eliminate the tracing and the light boxes! 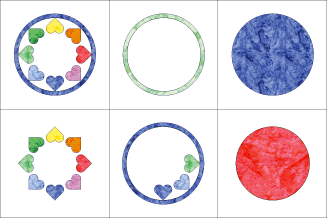 When the shapes are printed on the background, you can be sure you will have perfect positioning every time. 3. No tracing! No pecial markers! There is a simple test to ensure that the ink will not show in the finished quilt, even if it is never washed. Inklingo is amazing for back-basting, even on dark backgrounds. There is a detailed chapter about back-basting appliqué in The Inklingo Handbook. 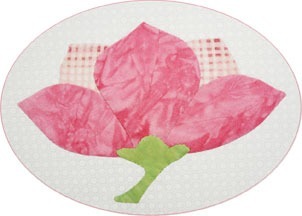 With Inklingo, you can appliqué by hand or by machine, with or without templates, or embroider or quilt the outlines! Inklingo prints all of the shapes on the wrong side of the fabric for back-basting, but you choose which of the elements to appliqué and which to ignore (above). Why do I have to place an order before I download?